While Wind Waker based products have gotten a ton of coverage on this site, it is time to review what is one of the more premium products a Wind Waker fan could own. Link’s Nendoroid is probably the cheapest and easiest to find of the Nintendo releases thus far and yet, he also has a ton of flexibility that is sure to please Nintendo fans. With that said, he has some surprising disappointments as well. Packaging – Much like the other Nintendo Nendoroids, the box is quite pleasing to the eye, especially the bold green color on the back. Seeing Link in a variety of poses is sure to inspire any fan or collector and make you want to try to the figure out for yourself. Link comes with a clear base, unlike Mario and Luigi and he also does not have a cardboard background piece either. Accessories – While the packaging is standard Nendoroid size, Link still comes what what seems like an amazing amount of accessories. A sword and shield are to be expected, but are still welcome additions. The Sword is a simple one that Link has early on in the game which is surprising when you compare it to the Toon Link Amiibo. With how great Good Smile Company does with details, it would have been nice to see the Master Sword here instead. To attach the sword, you have to pull of the bottom part of the handle, put the sword in the hole in Link’s hand and then reattach the bottom handle. This works well except for the small piece on the bottom of the sword is incredibly easy to lose so you have to be very careful with that piece. The shield looks outstanding from the shiny gold paint to the fine details on the King of Red Lions, Good Smile did fantastic work with it. Another impressive detail is the Spin Slash effect which has a nice color fade and the sword fits into snugly. You have to use an additional stand to get Link to hold up the Spin Slash and I found that it only looks good if you have Link’s arm pulled way back, but the effect looks fantastic even if it isn’t too flexible/easy to use. The heart container also looks great and it is really easy to show Link picking it up just like in Zelda thanks to one of the usual stands Good Smile includes with Nendoroid products. What is even more impressive is that Link comes with the Wind Waker so you can show him creating music just like in the game. Another familiar feature from Wind Waker is the numerous expressions that Link experiences and Nendoroid did not let Nintendo fans down there either. He comes with a smiling, determined, wary, and fierce facial expression which all have their own uses and each one can be seen in the pictures throughout this review. 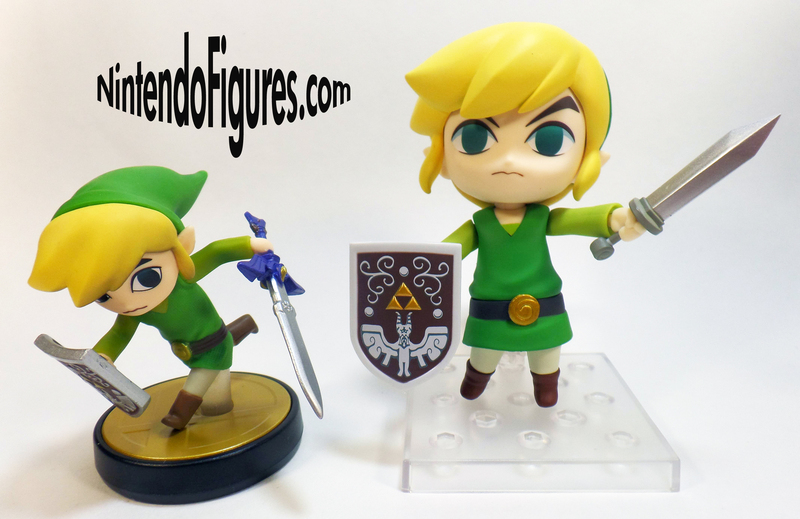 Poses – In addition to the accessories which can create their own poses like Link holding a heart container or composing a song, it is easy to put Link in a defensive position with the sword and shield like shown on the box or swinging his sword with the Spin Slash effect. If that weren’t enough, you can even show him sneaking like in the stealth segments of the game. Mario and Luigi both have a lot of poses, but I think Link may edge both of those Nendoroids in this category. And of course, this is an area where the Nendoroid puts the Amiibo to shame as you can see in the picture. Not only is it larger and more detailed, but you have a fair amount of flexibility too. Fragility and Flaws – While I’ve mostly been positive in the review so far, there are a few factors that surprised me with this figure. I talked about how easy it is to lose the pieces off this Nendoroid, but I was also surprised how easy it is to damage Link’s sleeves just getting the sword on. You have push the hand all the up on the sword and be careful what direction you pose the sword or the bottom part of the handle will push the plastic in the sleeve around. This makes the figure much more fragile and easy to damage than Mario or Luigi. In addition, the Spin Slash effect fits on the sword tightly and will mess up the paint on the sword very easily. I put the effect on twice knowing that it could damage the paint and sure enough, it already has. I don’t know how well the picture shows it, but I have to say that I am disappointed this happens so quickly and easily. Unlike the other Nendoroids, you have to very careful with this one or you will damage it. Closing Thoughts – While the fragility of Link is disappointing and I recommend you be very careful with him, I do think fans will love the details and accessories you can get with him. I hope that the Majora’s Mask Link is less fragile since he will have a different design and style as well. If you’re considering buying this Nendoroid, I give it a guarded recommendation, especially if you don’t mind the fact that you may want to play around less with this figure unlike other Nendoroids or action figures.